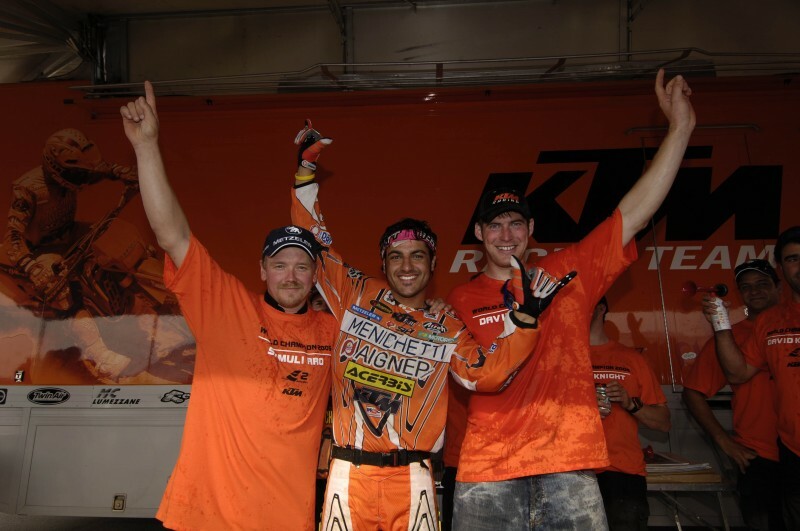 As good as it gets – exactly ten years ago, the KTM Enduro Team came away victorious across the board. KTM factory riders Ivan Cervantes from Spain, Samuli Aro from Finland, and David Knight from Great Britain won the Enduro World Championship overwhelmingly in all three classes. Moreover, the three world-class riders in the team managed by Fabio Farioli and Kari Tiainen didn’t even need any points from the final round held in the Italian Enduro stronghold of Bergamo. It couldn’t have gone better for KTM – all three World titles won on the orange racing machines from Mattighofen. Although the KTM factory riders had managed to bag four World titles five years beforehand, there were five titles to be won at the time. In the year 2000, Juha Salminen became 125cc World champion, Matteo Rubin won the 250cc four-stroke class, with Mario Rinaldi and Kari Tiainen donning the World championship crowns in the large four-stroke classes – Australian World champion Stefan Merriman was the only rider not to be sat astride a KTM, thereby thwarting absolute KTM success. It wasn’t until 2004 that the Enduro World Championship slimmed down from the near inflationary number of different displacement classes to the three that still apply today: E1 (125cc two-stroke / 250cc four-stroke), E2 (250cc two-stroke / 450cc four-stroke), and E3 (500cc two-stroke / 650cc four stroke). The Six Days has been around since 1913, when it was hosted by the English town of Carlisle as the “International Six Days Reliability Trial.” While the Six Days Trial has remained a team event until this day and several international offroad races, such as the famous “Valli Bergamasche” in Italy or the Alpine race in Velden on the Wörthersee in Austria, were held up until the late 1960s, there was no championship for individual riders until the European Championship was held for the first time in 1968. In the first few years, European titles were available in no less than eight classes from 50 to 500cc, some of which were only differentiated by 25cc of displacement. These were later supplemented with three more classes from 750 to 1300cc. Although brands from East Germany and Czechoslovakia dominated the bigger classes in the early days, KTM succeeded with Imerio Testori from the Italian Farioli team in breaking the stranglehold of manufacturers from behind the Iron Curtain for the first time and won the half-liter class in 1974. His compatriot Alessandro Gritti repeated this feat one year later in the 250cc class and, in 1978, Elia Andreoletti broke the winning streak of seemingly unbeatable Czech rider Kvetoslav Masita, who had won all ten of the European Championships held until then in the 350cc class. By the end of the 1970s, KTM had firmly established itself among the top manufacturers. The times in which only three brands competed for the European Championships were over. When reliability trials became Enduro championships in 1981, the multiplicity of classes was at first reduced to six, only for the new 350cc four-stroke class to be added shortly after and the 250cc four-strokes at a later date. In 1990, the former European Championship was upgraded to become the Enduro World Championship, but only when the EWC began marketing itself professionally in 2004 was the number of classes reduced to an easily comprehensible and hence crowd-friendly three. KTM has won over 40 rider’s titles since the Enduro World Championship was introduced and orange has been the dominant color in the EWC for many years now.